Choose from 5 exquisitely furnished rooms, each with its own individuality. The rooms are all air conditioned with modern and well appointed attached baths. Each of these rooms have their own charm and the guests are often hard pressed to choose which one to stay in! Once the master bedroom of the Sarkars, this room reflects the grandeur of a bygone era.A massive four poster bed, an ancient carved wardrobe, a dressing stool that the gracious lady of the house sat at and did her toilette. It also has an anteroom overlooking a peaceful lily pond. Sit by the window with a cup of coffee and watch scampering squirrels or enjoy the bird call. You won't notice the hours roll by. This room overlooks a bank of gulmohur trees and when the flowers burst into bloom, the shades of orange are simply breathtaking. It also has a private patio filled with a profusion of seasonal flowers and creepers, overlooking the Lukergunj Club grounds from where one can get a grand stand view of the local cricket or football match. Tucked into the most peaceful corner of the home, this rooms derives its name from the comfortable cane bed it houses. With wall to wall carpeting, it is probably the cosiest room at the Villa. An unexpected window seat opens into the garden and is an ideal place to enjoy a book over a cup of coffee. 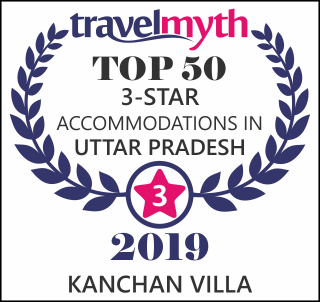 TTucked away in a secluded part of the first floor is the Kanchan villa suite. It has a private sitting room which overlooks the garden and the wide open sky. The bedroom is large and has a lovely antique four poster bed and wardrobe. The family suite has two double occupancy bedrooms, with a large and airy common bathroom. Enjoy the private sit out that or relax with a book from the well stocked library that is en suite. The family room is ideal for a family of four or two couples who enjoy each other's company.